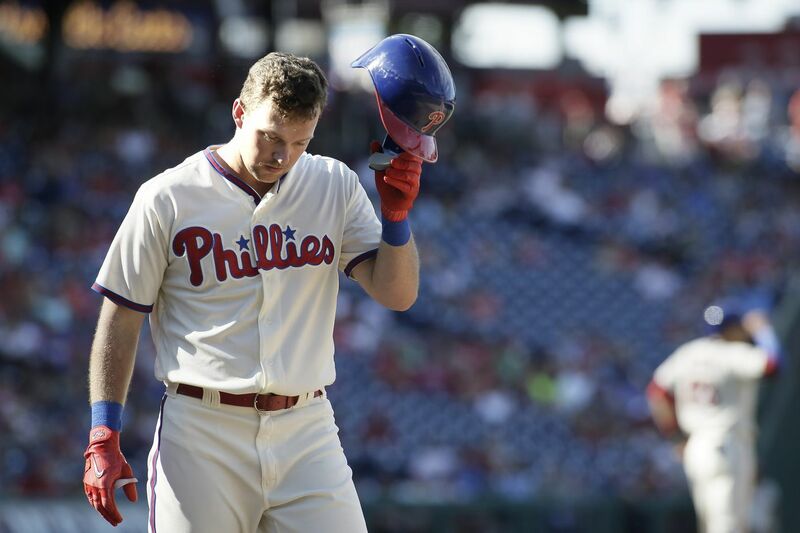 Rhys Hoskins walks away from the plate after getting called out on strikes in the seventh inning of the Phillies' loss on Sunday. The out-of-town scoreboard flickered early Sunday afternoon to update the score from Atlanta after Washington took a fast lead over the first-place Braves. And then Cesar Hernandez hammered the very next pitch over the right-field fence for a leadoff homer. If the Phillies were to make an unlikely playoff push, this sure seemed like the perfect way to start. Instead, it was just the perfect start to deflating afternoon when a 6-4 loss to the Marlins cast even more doubt on the team's chances to play in October. The Braves fell to the Nationals, but the Phillies were clobbered by the Marlins. An out-of-town scoreboard is of little help when you fail to take care of your own business. The Phillies had won their first series in six weeks, yet picked up just one game over the Braves while moving three games closer to the end of the season. They started Friday with a 7½-game deficit and 17 games remaining. They will begin Monday with a 6½-game hole and 14 games remaining. Sunday was a missed opportunity. The Phillies still play the Braves seven times, but a playoff berth is hard to fathom. "We definitely seek to capitalize on every opportunity possible," manager Gabe Kapler said. Hernandez's leadoff homer failed to trigger an onslaught, as the Phillies would not score again until the seventh inning. Jose Urena tamed them for five innings and the Phillies had just five hits before putting together a two-out rally in the ninth. The Marlins erased the Phils' early lead with a two-run homer in the fourth by Peter O'Brien off Nick Pivetta, who allowed three runs in five innings as he struck out eight and walked one. "Stuff was electric," Kapler said. "I think the only hard-hit ball that comes to mind for me was the home run to O'Brien. Other than that the curveball was working well, the fastball was working well, had a lot of life to it obviously getting tons of swings and misses on it. Looked like he was going to roll and just ran into a little bit of a buzzsaw there." The home run would not have happened if the Phillies had been able to complete a double play on the preceding batter. Starlin Castro chopped a grounder to Pivetta, who turned and fired to second base. But second baseman Hernandez and shortstop J.P. Crawford both were standing on the bag. Crawford caught it for one out, then threw over Hernandez, and over the head of first baseman Carlos Santana. The inning continued. "I think there was a little bit of congestion there with J.P. and Cesar," Kapler said. "That's part of the game. Happens sometimes, certainly." The Phillies scored twice in the ninth inning when Roman Quinn singled home Aaron Altherr and then scored when Hernandez reached on an error. The rally, which ended on a strikeout by Rhys Hoskins, would have felt a bit more threatening had it not been for what happened after Pivetta was lifted. Kapler yanked Pivetta after just 80 pitches as he has used an aggressive hook this month with the season waning and an expanded roster full of relievers. But the bullpen burned him on Sunday. Luis Garcia allowed three runs in the sixth and the pitcher was booed as his third run crossed on a wild pitch. By then, it felt like an eternity since Hernandez answered the news from Atlanta with his homer. And it felt even more unlikely that the Phillies could pull off the unlikely this month. "I'm just going out there and going as deep as I can," Pivetta said. "As soon as the manager says you're done, you're done. I can only control what I'm doing in that game and can only control the decisions that are made with me. When I get pulled, that's the manager's decision. That's up to him."